Having the right technology is an essential part of enjoying your online gaming experience. Nothing is worse than being hampered by technology that can’t handle the gameplay or is simply not designed to work with online gaming. When it comes to crystal clear graphics and enhanced visual gameplay, the right monitor can make all the difference. For an unbeatable level of quality, most gamers are choosing to go with an IPS monitor to best suit their needs. So What is an IPS Monitor? IPS stands for In-Plane Switching, and is a technology mainly found in high end monitors. It has been developed to combat poor colour reproduction and limited viewing angles. They are popular with people who need a quality monitor for professional creative uses, such as design and photo-manipulation, as well as with people needing high quality graphics for gaming. When you can’t compromise on picture quality, IPS is simply the best monitor on the market for all of your high quality creative needs. Why Does it Suit Gaming? 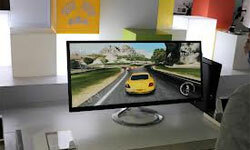 There are a number of reasons why an IPS monitor is perfectly suited to gaming. The life-like picture quality is rich in colour, provides fantastic depth and contrast, and minimises any colour distortion. IPS monitors are professionally calibrated and tuned to provide the highest standards of colour quality. You’ll notice that whites seem much purer, black seems darker and individual colours are really displayed to their very highest potential. The smooth colour changes are perfectly matched to the high speed action content of games, which greatly reduces the instance of any colour blur. The sheer quality of detail and levels of contrast allow you to experience your games like never before. Once you have experienced gaming on a quality IPS monitor, you’ll never want to go back! However IPS monitors aren’t just great for gaming. Watching movies and browsing the internet are all enhanced by the incredible quality and clarity of the images displayed through the monitor. The impressive and eye-catching level of picture quality will transform your expectations, and allow your movies and games to truly come to life. What is Wide Angle Viewing? Wide angle viewing allows you to easily view the screen whether you are sitting, standing or even lying down. No more will you have to constantly shift your posture or the position of the monitor, with wide angle viewing you can see crystal clear images from wherever suits you the best. Say goodbye to inconvenient screen glare obscuring your view of the action, and discover the ease of wide angle viewing. With all of this in mind, it’s easy to see why more and more online gamers are choosing IPS as their preferred monitor. Crystal clear colour, incredible depth and reduced colour blur make it perfect for all of your advanced gaming needs. Discover the world of IPS, and see why these amazing monitors are simply the best for online gamers. Emma Jane is a stay at home mom. She writes reviews on blogs regularly and loves to road test any new products.